In ancient Europe Ash trees were used to make spear shafts, household crafts, and bows. The proto Indo-European word for Ash gave us the words for spear, lance and javelin in several European languages. Ash was an important fodder tree for Neolithic farmers. 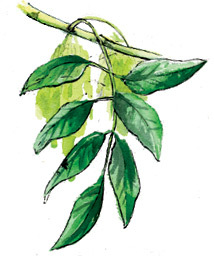 The tender tips and leaves of the European Ash were used as a tea for gout, jaundice, and rheumatism. In winter the branch bark or the bark of the root was employed. Spring gathered leaves were dried for later use as a gentle laxative (the American White Ash is used similarly). In Greek tradition it was said that Zeus created humans from Ash trees. Yggdrasil was the Cosmic Ash upon which Odin hung for nine days until He discovered the runes. It was also the horse of Odin, who like the mare of Muhammad, bore him to the skies for a glimpse of heaven. 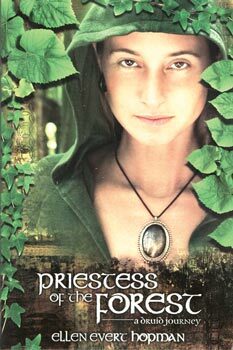 On-Niona was the Gaulish Goddess of the Ash groves. The Irish word for Ash, Nion, was also the word for heaven, Nionon. The Icelandic word Aske meant “blaze of great fire”, Ash being one of the best fire woods (especially when burned green!) as well as leading to the fires of enlightenment. Considered a Solar tree, its wood is used for the Yule Log. Druids carved charms from its wood. Ashen divining rods were cut on Summer Solstice. A Druidic Ash wand decorated with spirals was found on Anglesey. Eating red Ash buds at Midsummer brings protection from sorcery. Witch’s brooms, used for flying, are traditionally made of an Ash pole with Birch twigs and Willow bindings. Ash “draws the flash” and so is used in rain magic. In Scotland it was believed that carrying the keys, or seeds, brought protection from evil sorcery. Ash sticks were preferred for herding cattle for they were sure not to injure an animal. Snakes were said to avoid Ash trees and their fallen leaves, an adder could be killed by a single blow from an Ashen stick. A circlet of Ash twigs was worn around the neck to heal snake bite. Ash sticks were carried in snake infested woods and according to Pliny, drawing a circle with an Ash wand around a snake would cause it to die. Ash trees were used in weather forecasting. If the Oak leafed first dry weather would follow. If the Ash leafed first wet weather was forecast. In Lincolnshire, England, it was said that the female Ash, the Sheder, could be used to overpower a male Witch and the male Ash, the Heder, could be used to overpower a female Witch. In Leicestershire a child with warts was carried to an Ash tree in April or May. A pin would be stuck into the tree then into the child’s wart until pain was felt and then into the tree again and left in the bark. The rhyme “Ashen tree, ashen tree. Pray buy this wart of me ” was recited. In the Highlands of Scotland at the birth of a child a branch of Ash was placed in the fire. The sap which was forced out at the ends was collected in a spoon and fed to the infant. Children with hernias, weakness, or rickets were passed through a cleft in an Ash sapling, before sunrise, while fasting. The slit in the tree was then bound and as the tree healed, so did the child. If the tree was later cut down the child would be re-injured and so woodcutter’s often found these trees full of nails. In Herefordshire a lock of a child’s hair was pinned to an Ash to cure a bad cough.